Phil Clarke and Terry O'Connor may have predicted that the Red Devils will finish 11th and 8th at the end of the season, but Salford coach Ian Watson is taking great delight from watching his side defy the critics. "If you listen to Sky, they don't think we should be in the league but people have their opinions," Watson said. "They said us and London would be down at the bottom of the table but we'll see who's right at the end of it. "We're confident as a group, We don't need to shout about it, we just need to go about our business and do our job." Joel Tomkins has returned to Hull KR after being admitted to hospital after suffering a serious concussion in their loss to Warrington on Saturday. Tomkins was on the receiving end of a hefty challenge from Blake Austin while lying on the floor during the first half at the Halliwell Jones Stadium, with Rovers coach Tim Sheens describing his captain as being "in a bad way". 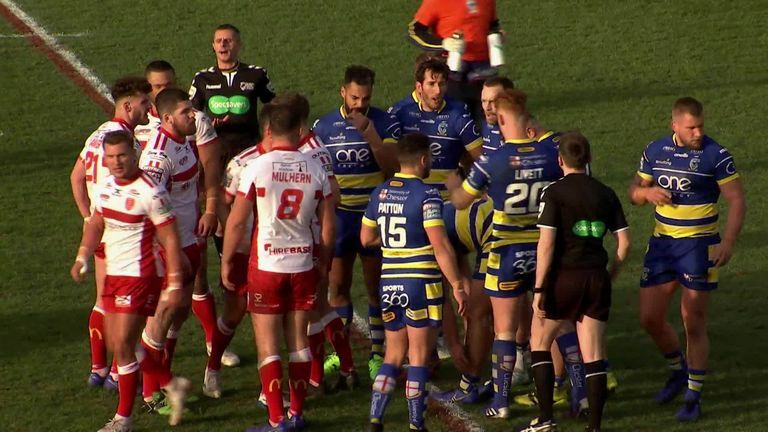 Austin was sent to the sin-bin for the challenge by referee Liam Moore and the incident will no doubt be looked at by the RFL match review panel. It looked like we were heading towards our first Golden Point of the season when up pops Louie McCarthy-Scarsbrook to steal it for Saints with two minutes remaining against Wakefield! Tom Johnstone was outstanding for trinity - displaying his outstanding trademark finish where he flew through the air on the way to the first of his two tries. Saints coach Justin Holbrook was impressed with the way his team hung in against motivated opposition. "It was a really tough game, everything we expected after their disappointing loss last week and with it being their first home game," he said. 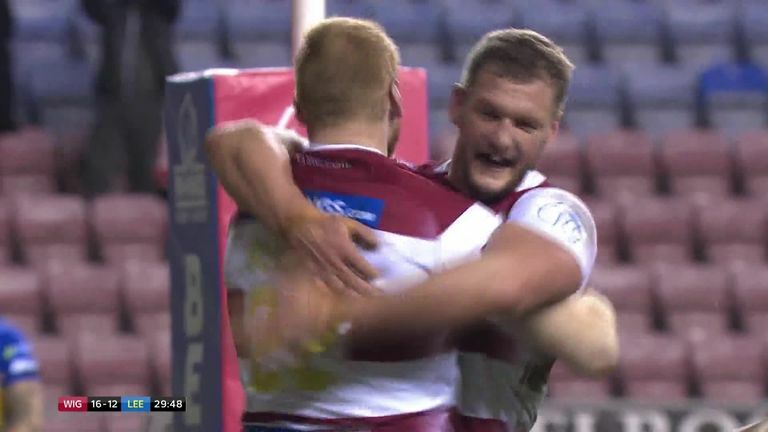 The form of George Williams bodes well for Wigan a week out from the World Club Challenge against Sydney Roosters. Williams was almost untouchable at times as he produced an all-round display to help Wigan see off Leeds 34-16. Williams sent Dan Sarginson and Joe Greenwood over in the first half, before scoring one of his own in the second half as he controlled the game with some slick passing and clever kicks. "They were just little kicks," he said of his two assists. "Sarge and Joe got on the end of them and did well to finish them off, but I'll take a bit of credit. "I think it's a good job I did score the try because I should have passed to Oliver Gildart as he was free on the left edge. I found a way to get over, though, and it was nice to get off the mark in the new season." A man-of-the-match performance from Sam Tomkins helped Catalans to a 27-10 win over Huddersfield. Tomkins, playing in his home debut in Perpignan, scored a try and kicked five goals as the Dragons secured their first win of the season. Huddersfield got off to a great start but could not make the most of it and let the Dragons back into the game as two quick-fire tries from Brayden Williame got them right back into the mix. "We had an awful start to the game. Huddersfield came out and dominated field position for 15 minutes of the game and we were under pressure," said Catalans coach Steve McNamara. "So I was really pleased with the tenacity to fight back through that period." Matty Russell scored four tries in Toronto's record away win at Rochdale to help the Wolfpack to a comfortable 58-6 win. 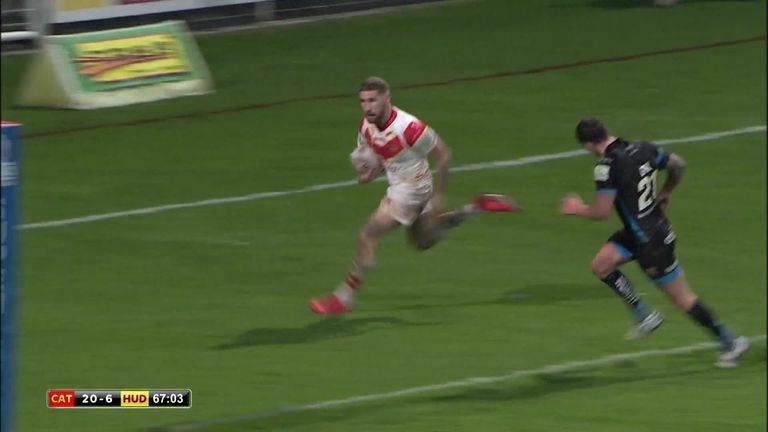 Also in the Championship, Widnes had a good win at Toulouse, which nicely sets up a clash between two unbeaten teams on Sky Sports on Saturday when Toronto "host" the Vikings in Newcastle. As they say in North America: "Somebody's 0 has got to go!"